Imagine you're out on the Appalachian Trail, running low on gorp, trying to figure out whether you can make it to the next shelter before nightfall. Do you rely on your equipment to guide you to safety? 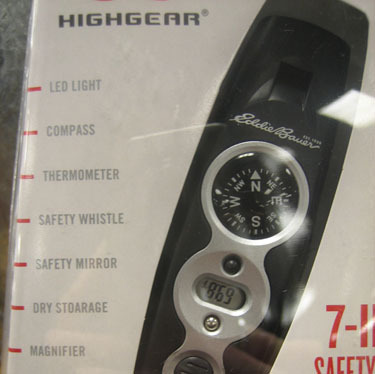 Do you have a whistle with a clear tone, a reliable compass, a strong light to illuminate your path? Or do you have this? Perhaps you should have paid closer attention to the packaging. The manufacturer certainly didn't. Copyeditor General's ruling: Now how safe do you feel?